In Turkey, Schools Will Stop Teaching Evolution This Fall : Parallels When Turkish children head back to school, something will be missing from their textbooks: any mention of evolution. The government is phasing in what it calls a values-based curriculum. 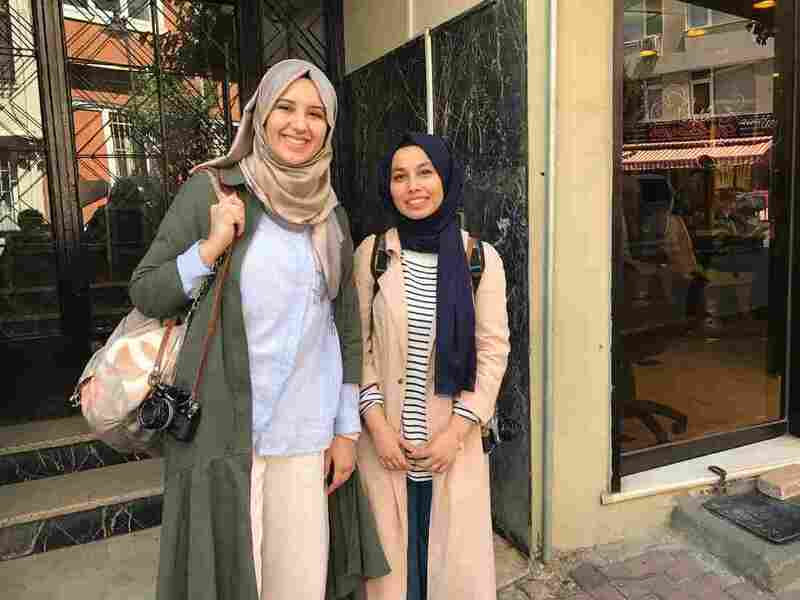 Zeynep Terzi, left, 23, a medical student in Istanbul, and Betul Vargi, 22, a college student studying English literature, are part of what Turkish President Recep Tayyip Erdoğan calls a new "pious generation" of Turks. They wear headscarves and attend mosque, but they also believe in a separation of religion and state. When children in Turkey head back to school this fall, something will be missing from their textbooks: any mention of evolution. The Turkish government is phasing in what it calls a values-based curriculum. Critics accuse Turkey's president of pushing a more conservative, religious ideology — at the expense of young people's education. At a playground in an upscale, secular area of Istanbul, parents and grandparents express concern over the new policy. "I'm worried, but I hope it changes by the time my grandchildren are in high school," says Emel Ishakoglu, a retired chemical engineer playing with her grandchildren, ages 5 and 2. "Otherwise our kids will be left behind compared to other countries when it comes to science education." With a curriculum that omits evolution, Ishakoglu worries her grandchildren won't get the training they'll need if they want to grow up to be scientists like her. Nearby, an American expat who's married to a Turk pushes her toddler on the swings and describes a book they've been reading at home. "It's for 3- to 5-year-olds, and it teaches evolution," says Heather Demir. "It starts off, 'I used to be fish, but then I grew some legs.'" The Demir family plans to leave Turkey before their son reaches grade school, in part because of this new curriculum. 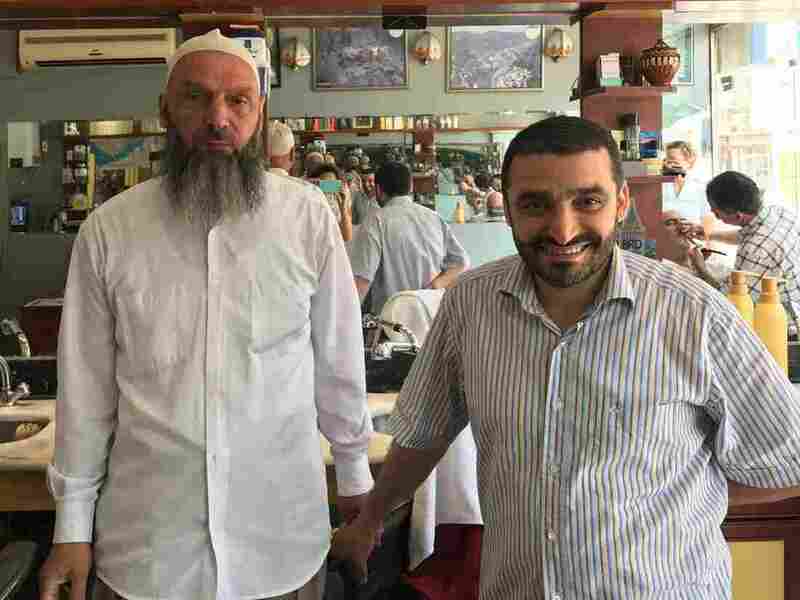 Suat Keceli, left, a retired stockroom worker, and his barber Yasar Ayhan pose in Ayhan's barber shop in Kasimpasa, the Istanbul neighborhood where President Recep Tayyip Erdoğan grew up. Keceli is a conservative Muslim who kept his daughter out of school when headscarves were banned in the classroom. "I just think it'd be too confusing for him, to teach him two opposing viewpoints," Demir says. At a news conference last month, Turkey's education minister announced that new textbooks will be introduced in all primary and secondary schools, starting with grades 1, 5 and 9 this fall, and the rest next year. They will stop teaching evolution in grade 9, when it's usually taught. "Evolutionary biology is best left to be taught at the university level," Education Minister Ismet Yilmaz told reporters. "It's a theory that requires a higher philosophical understanding than schoolchildren have." That means students who don't go on to university may never learn who Charles Darwin was. "Among scientists, of course, we feel very sorry and very, very worried for the country," says Ali Alpar, an astrophysicist and president of Turkey's Science Academy, an independent group that opposes the new curriculum. A Turkish association of biologists and teachers' unions have also expressed concern about the new textbooks. "It is not only evolution. Evolution is a test case. It is about rationality — about whether the curriculum should be built on whatever the government chooses to be the proper values," Alpar says. He also objects to how the government has converted many secular public schools into religious ones — Turkey's publicly funded Imam Hatip schools — in recent years. Some Muslims, like some Christians, believe in creation, not natural selection. Turkey is majority Muslim, with a constitution that emphasizes its secular character. But a battle has been underway between secular and religious Turks ever since President Recep Tayyip Erdogan came to power. He was elected prime minister in 2003, and president in 2014. Erdogan does not support implementing sharia law. But he has repeatedly been elected by religious voters who felt their beliefs were neglected during decades of enforced secularism. In a barber shop in the Istanbul neighborhood where Erdogan grew up, a bearded man in a traditional Muslim cap chats with the barber as he gets a shave. He explains how he kept his daughter out of school when Turkey didn't allow girls to wear headscarves in classrooms. The ban was lifted in middle schools and high schools in 2014. "In school, they taught us humans evolved from monkeys. But that's not true," says Suat Keceli. "I support our government taking it out of biology textbooks. I think it's Satan's work." In revising these textbooks, the government sought input from a small cadre of religious academics, including the president of Turkey's Uskudar University, a private institution that will host an academic conference on creationism this fall. "Most Turks don't believe in evolution because it implies that God doesn't exist, and we're all here on earth just by chance! That's confusing," says the university's president, Nevzat Tarhan. "Turkey is a modern democracy, but we should not be afraid to embrace our Islamic culture as well." Outside an Istanbul flower shop, two college students, Zeynep Terzi and Betul Vargi, are part of what Erdogan calls the new "pious generation." They wear headscarves. But they also support the separation of religion and state — and accuse the president of chipping away at it. "You can't learn religion in school, I think. It's about you and God. You should learn maybe in your home," Terzi says. "They can send their kids to mosques. Schools are for science, I think," says Vargi. Terzi is in medical school. Her scientific training in Turkey makes her competitive for jobs here and abroad. But she fears that might not be the case for the next generation of pious Turks.